Emerges without much dust, ready for fourteenth Earth year of ops - rather longer than planned 90-day mission! It has been the week of long-lived space hardware: first came the news of Voyager 1's thrusters working after 37 years without use and now NASA's cautiously suggested that the Opportunity rover on Mars will be fit to roll into its 14th year of red planet operations. Two big threats imperil Opportunity's ongoing operations. The first is Mars' winter, as it relies on solar energy and to harvest that it needs a favourable parking spot that tilts it to the North. 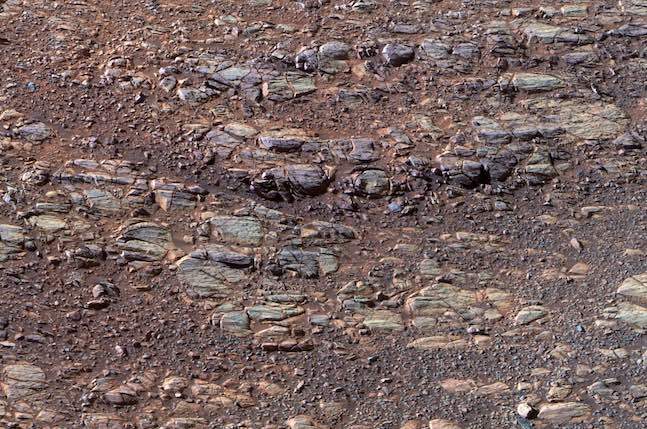 Opportunity's twin, Spirit, succumbed in 2009 after two wheels failed and it couldn't orient itself to the North and couldn't catch sufficient rays to resume operations. The second threat is dust, as when it gathers on solar panels they become less efficient. Mars is infamous for its spring dust storms, so emerging from winter with dusty panels is not welcome ahead of storm season. The good news is that NASA's announced that Mars' darkest weeks ended in November and Opportunity has power and, happily, has had some of its dust cleaned off by wind. That assessment's seen mission boffins declare the rover ready to roll, and in such good condition that it could probably survive a proper planetary dust storm. Once it is up and rolling, NASA plans to send Opportunity down Perseverance Valley, a feature cut into the rim of Endeavour Crater. NASA sent it there because after years on the Crater's rim it was felt we'd learned all we could about conditions at the top, but needed to know more about the inside of the crater. It is thought Perseverance Valley was carved by fluid, but past observations haven't proven that hypothesis.